You’ve ranted. You’ve raved. You’ve freestyled, soapboxed, and even waved a magic wand or two. Today, let’s keep it positive. Who (or what) is doing something good? Share a story of your positive action, whether it’s a favorite charity, foundation, or nonprofit – or just an individual whose penchant for do-goodery makes you feel all warm and fuzzy. This year, I had the privilege of joining the team at RecycleForce. For those of you in Indy that haven’t heard of RecycleForce, listen up! This not-for-profit organization takes two social missions and ties them together into one. Taking the electronic waste and other recyclables provided by residents and corporate partners, RecycleForce deconstructs these items, recycles the materials and disposes of the waste safely and cleanly. The scrap metals and other reusable materials collected in this process are then sold to help pay for job training programs and employment opportunities for formerly incarcerated men and women in order to support their re-entry back into society. In my time with RecycleForce over the past few months, I’ve met some really inspiring individuals. These men and women made a mistake, did their time and want to change their lives around. I’ve heard all sorts of stories from the employees at RecycleForce…some have moved on and gained employment at other companies around the city, bought houses, bettered themselves, brought their families back together and most importantly have gained a sense of pride in what they do and who they have become. The employees at RecycleForce inspire me to try and be a better person as well. Led by RecycleForce President Gregg Keesling, this organization is so important for our city but doesn’t necessarily get the attention it deserves. Multiple studies show that formerly incarcerated individuals are less likely to reoffend if they have a job. At RecycleForce, we aim to reduce recidivism by recycling electronic waste. Take a step back and think about the situation. When a person gets out of prison, it’s near impossible for them to get a job. One RecycleForce employee said his game plan was to go work as a dishwasher, but he couldn’t get hired at any restaurant due to his past. So what will the ex-offenders turn to if they can’t get employment? Perhaps a way to make money that isn’t legal. And you, as a member of the Indianapolis community, don’t want that in your neighborhood. So why not give these men and women a place to go where they can get workforce training, counseling, peer mentorship and assistance to turn their life around? Not to mention you’re helping save the environment at the same time. Everyone makes mistakes and everyone deserves a second chance. 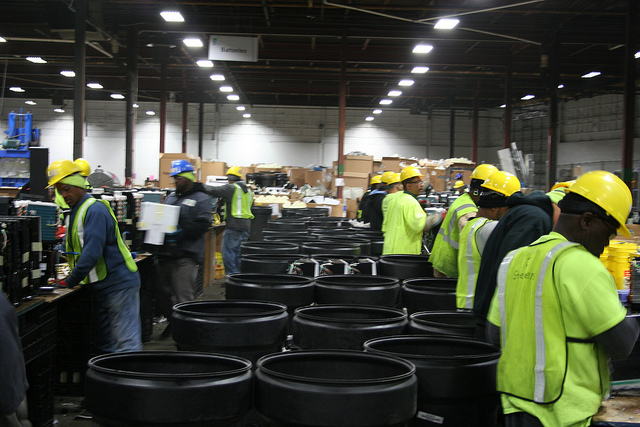 RecycleForce is leading the way for a cleaner environment and a stronger workforce in Indianapolis. Whether you have an old television to recycle or you’re a company that needs to get rid of old equipment, RecycleForce will take that e-waste off your hands and turn it into a job. You can drop old electronics off at their drive-through facility or during a recycling event, or have the crew come do a pick up from you in their truck for larger items. Help spread the word about RecycleForce next time you hear of someone needing to get rid of any type of electronics. If it has a plug (or even if it doesn’t), RecycleForce will take it. And maybe their employees can inspire as they have me. Tags: banthebox, ewaste, Indianapolis, nonprofit, recycleforce, recycling, thinkkit, workforce. Bookmark the permalink.